Fig. 1. 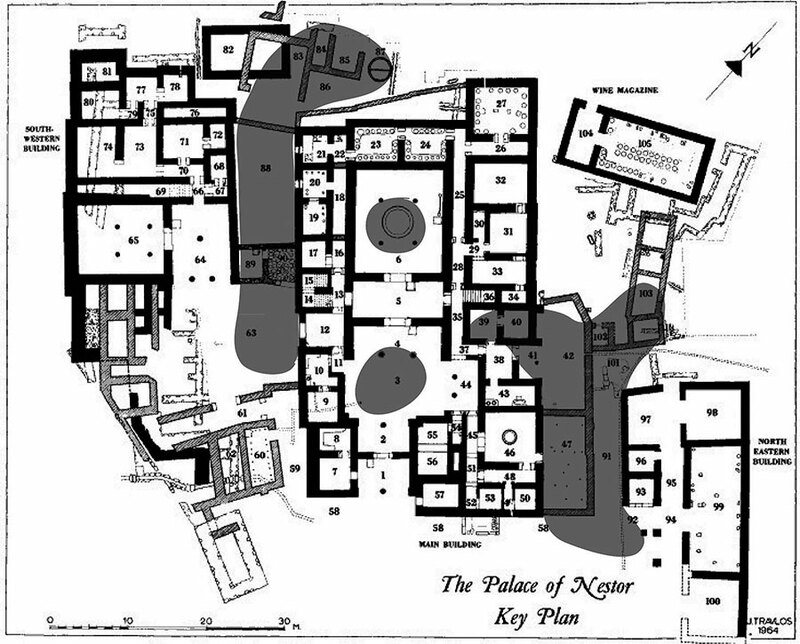 Plan of the Palace of Nestor, showing distribution of greasy black stratum (modified from Blegen and Rawson 1966; courtesy Department of Classics, University of Cincinnati). Fig. 2. Room 19 modified Harris Matrices. Fig. 3. Room 20 trench R2 and adjoining sections, modified Harris Matrices. Fig. 4. Room 38 and Room 39 modified Harris Matrices. Fig. 5. Room 40 and Porch 41 modified Harris Matrices. Fig. 6. 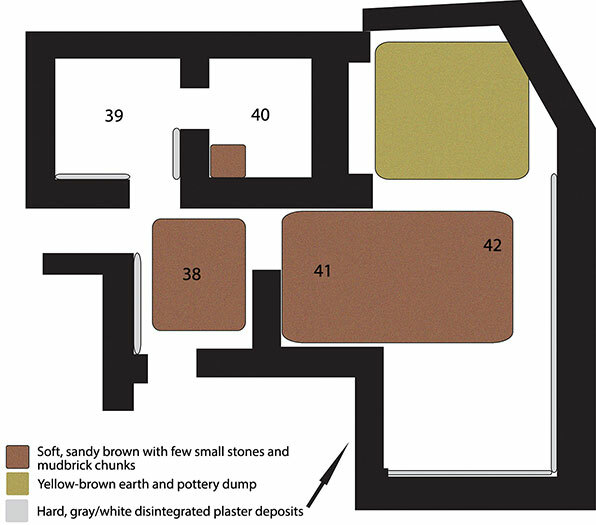 Plan of Rooms 38–40, Porch 41, and Court 42, phase 1 post-destruction deposits. Fig. 7. 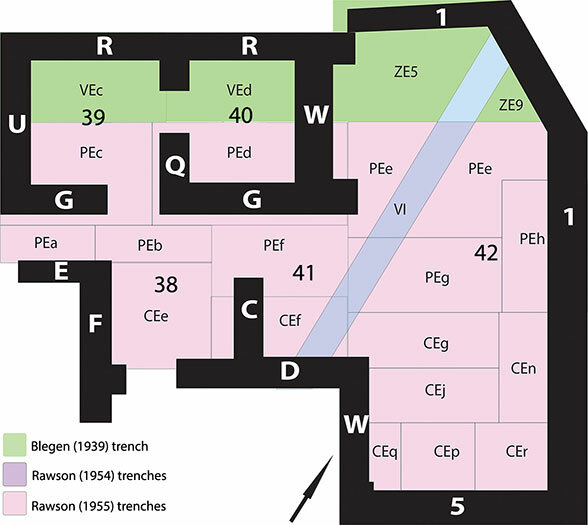 Trench plan for Rooms 38–40, Porch 41, and Court 42. Fig. 8. 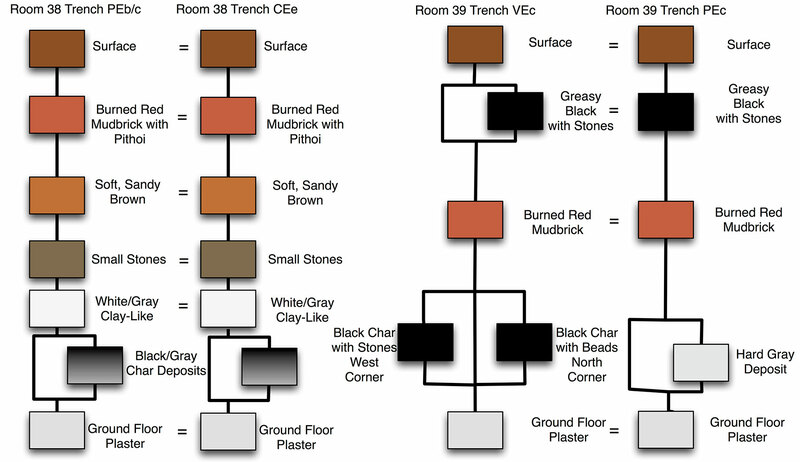 Section drawing of Room 38, trench PEb, northwestern balk (adapted from Rawson 1955, 18; courtesy Department of Classics, University of Cincinnati). Fig. 9. 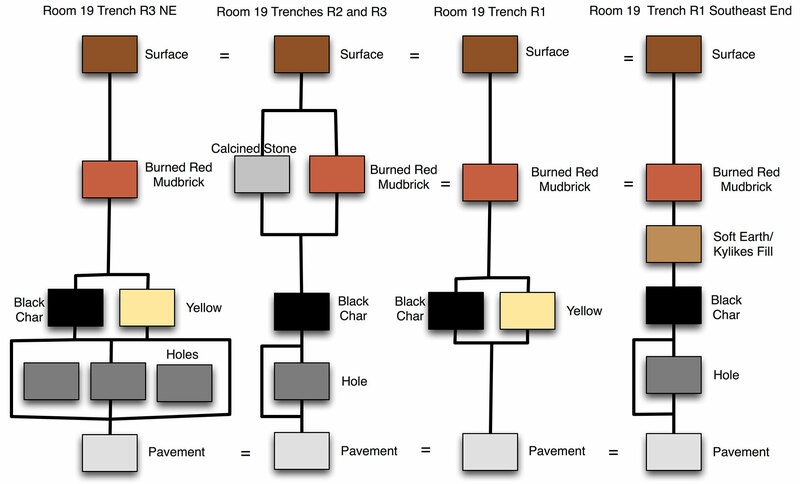 Section drawing of Room 38, trench PEb, southeastern balk (adapted from Rawson 1955, 18; courtesy Department of Classics, University of Cincinnati). Fig. 10. 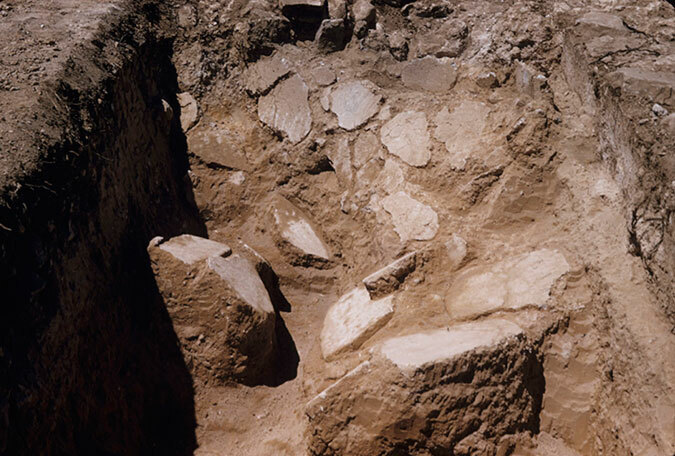 Fallen floor plaster in Room 39, trench VEc, view from the northeast (Palace of Nestor Excavation Archives, slide P.54.4.9; courtesy Department of Classics, University of Cincinnati). Fig. 11. 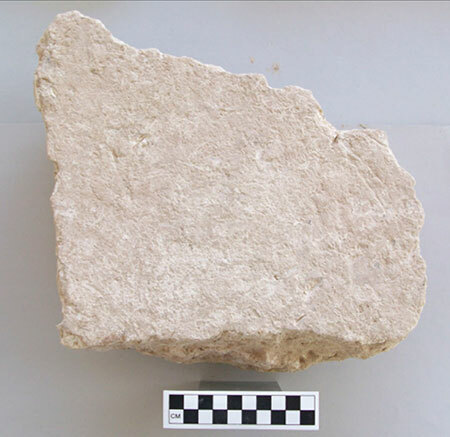 Fallen floor plaster fragment from Room 39, trench VEc (E. Egan). Fig. 12. 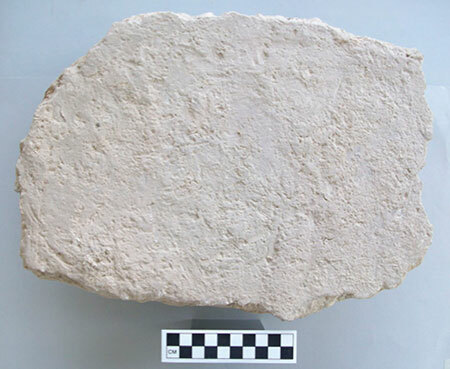 Fallen floor plaster fragment from Room 39, trench VEc (E. Egan). Fig. 13. 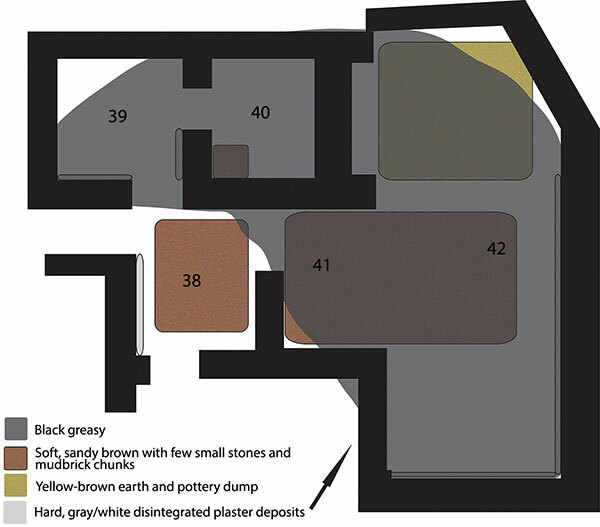 Plan of Rooms 38–40, Porch 41, and Court 42, showing relative distribution of reuse deposits. Blegen, C., and M. Rawson. 1966. The Palace of Nestor at Pylos in Western Messenia. Vol. 1, The Buildings and Their Contents. Prince­ton: Princeton University Press. Rawson, M. 1955. “Pylos.” Unpublished field notebook. Cincinnati: University of Cincinnati.